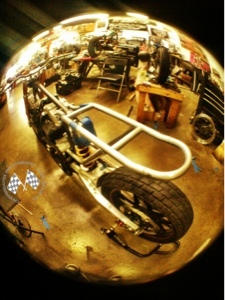 Dave is out of hiding and we have a few sneak peak pics of his BF 5 build. He said this is the bike that’s been in his head for a while and now is the time to do it.If you have been following him on Instagram you have seen the insane amount of work he has done!! Its unreal and inspiring. Dave’s quote is “this build might kill me”…lets hope not. Dave is also one of the 18 builders in the bike giveaway promo…. So yes folks you can win Chopper Dave’s bike!